Travellers heading to airports in London are significantly more likely to use public transport than those flying from regional airports, a survey shows. Stansted has the highest proportion of public transport users at 50%, followed by London City (46%) and both Heathrow and Gatwick on 41%, according to the latest passenger survey report by the Civil Aviation Authority (CAA). Of the regional airports surveyed, people travelling to East Midlands are the least likely to use public transport at just 7%, followed by Doncaster (9%), Leeds Bradford (11%) and Manchester (16%). Wherever people are flying from, it is important they have sufficient travel insurance cover in case anything goes wrong. The CAA believes passengers may not be fully aware of all the options open to them when travelling to the airport. Policy director Tim Johnson says the survey points to a "marked difference" in the way people travel to airports, with a much higher percentage using public transport to get to the five London airports compared with airports elsewhere in the UK. This "raises the question of whether each of the airports has the optimum balance of public and private transport options", he says, adding that passengers may also be unaware of alternative ways to get to the airport. The CAA survey, which quizzed 232,000 travellers, also found that London City has the highest proportion of business passengers at 52%. Doncaster, on the other hand, has only a small percentage of business passengers, with 93% of its customers travelling for leisure purposes. Heathrow has the highest proportion of passengers taking connecting flights (35%), ahead of Gatwick (7%). All the other airports surveyed have less than 5%. Last week, Transport Secretary Patrick McLoughlin insisted that air quality will be a "major consideration" when the Government makes a decision on airport expansion. In July, the Airports Commission recommended building a third runway at Heathrow. 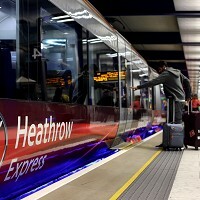 Heathrow has pledged to have no more airport-related road traffic after an expansion, by improving rail links to encourage passengers and staff to use public transport.